For those who may or may not know, I am a twin. Yes, I have a twin sister and we are identical (although we can’t see it.) However, for the last few months she has been suffering with a condition called, Trigeminal Neuralgia and for those of you who have never heard about it, let me explain. This disease is described as a chronic pain condition that affects the trigeminal nerve, which carries sensation from your face to your brain and with trigeminal neuralgia, even mild stimulation of your face — such as from brushing your teeth or putting on makeup — may trigger a jolt of excruciating pain. The pain is so debilitating that this condition has been called “The Suicide Disease” because many have taken their own lives. Oh, but God has been keeping her and times when many would have given up; she has held on. When others have called it quits, she has called on God. Her faith has sustained her and I am in awe of her strength. Oh, her faith has withstood because God had to bring her through that in order to get her to her healing and her healing will happen at the hands of a man that God has led her too by the name of Dr. Robert Mericle of HW Neurological Institute in Nashville, TN and God, along with Dr. Mericle, will perform surgery on her on December 17, 2013. The surgery she is scheduled to undergo is called MVD or Microvascular decompression. The surgery consists of relocating or removing blood vessels that have come into contact with her trigeminal nerve. During microvascular decompression, the doctor will make an incision behind her right ear. Then, through a small hole in your skull, he will move any arteries that are in contact with the trigeminal nerve away from the nerve, and place a pad between the nerve and the arteries. If a vein is compressing the nerve, he may remove it. After the surgery, she will remain in the hospital for 1 to 2 days and then she will have 3-6 weeks of recovery. The surgery will take place in Nashville, TN and we will be there for at least a week. It is because of this that I am putting together a benefit party to raise money for the expenses that have been and will be incurred. 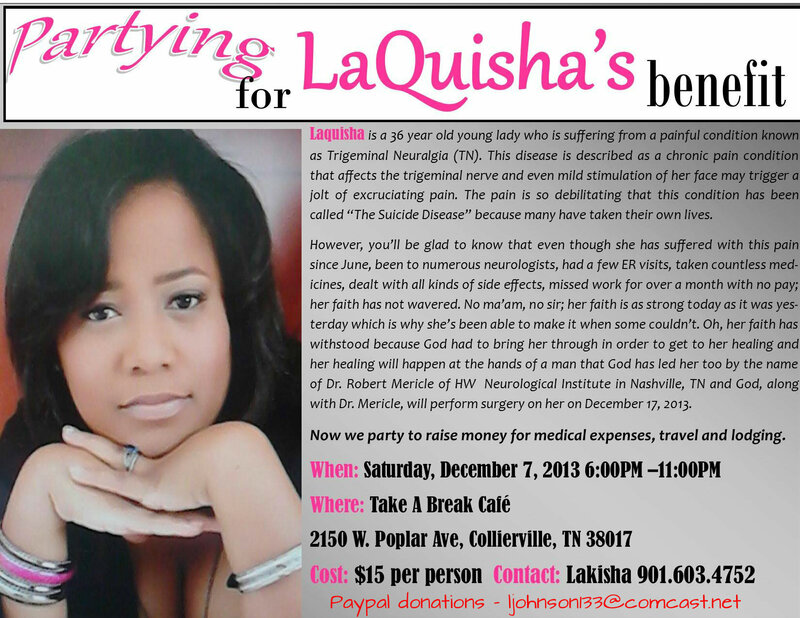 Expenses such as travel and lodging, medicine and hospital stay (that’s not covered by insurance) and to assist with Laquisha’s bills until she is able to get back to work. If you would like to donate, you can do so through paypal (ljohnson133@comcast.net) or email me at ljohnson133@comcast.net. No amount is too small. Even if you can’t donate money, your prayers are sufficent enough for us both.